This entry was posted on Saturday, August 23rd, 2008 at 3:39 am and is filed under Uncategorized. You can follow any responses to this entry through the RSS 2.0 feed. You can leave a response, or trackback from your own site. 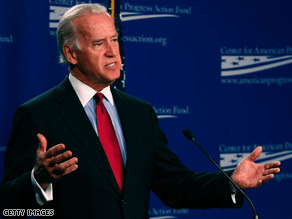 another thing you should know about biden – HE VOTED FOR THE IRAQ WAR! obama touts his “sound foreign policy judgement” in the fact that he made a speech against the war, without ever having been required to cast a vote (since he wasn’t even in the senate at the time) – yet he chooses a vp candidate that voted for the war?!?!?! the hypocrisy is mind-boggling.